The smaller space at the Crow’s Nest Theatre is a great venue for The Howland Company’s production of Punk Rock, a show that inspires both admiration on a production level and some low-burn consternation. The play starts out as an ordinary story about several teenagers in a small British town: in the first scene we see William introducing a new student, Lilly, to the others: Bennett, the alpha, Nicholas, a quiet jock, and Chadwick, the resident nerd and outcast, along with Bennett’s perfectionist girlfriend Cissy, and her nerdy friend Tanya. The cast is strong across the board with great chemistry, creating a visceral sense of the angst and uncertainty and tension of being a teenager on the precipice of adulthood. The actors managed to portray the intense emotional lives and levels of maturity and immaturity without veering into caricature, and throughout the performance I was torn between being amused and delighted by them, and feeling deep anxiety and shame on their behalf. James Graham as Bennett is the bully of the crowd, but managed to play that character on a few different notes, at times charming, at others completely repugnant, while still offering up moments of vulnerability that managed to round this character out enough for me to not totally hate him. Andrew Pimento does a great job on the opposite end, playing the nerdy outcast Chadwick with a patient resignation that stayed clear of portraying him as a total victim. Kristen Zaza’s sincerity and vulnerability throughout were captivating. Ruth Goodwin plays the coveted Lilly with a kind of playful deceit balanced with cautious empathy to make her relatable despite how alienating those girls were to me twenty years ago. Cameron Laurie as William has the hardest job, navigating a complicated and implicit emotional struggle throughout the play, vacillating between his attempt to charm Lilly, the delicate dance of wrangling Bennett back from his abusive behaviour, and his own intense insecurity and loneliness that he works so hard to hide. The set and the lighting are straightforward and effective: Jareth Li and Nancy Anne Perrin use a series of tables and chairs to create the banal sterility of high school library in which the teenagers convene between classes. 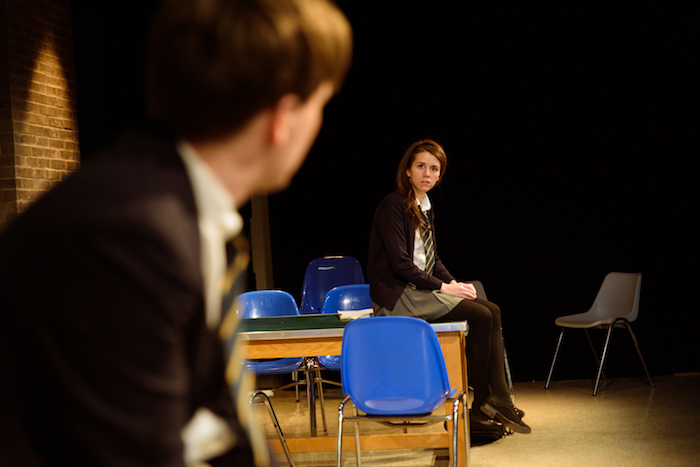 The actors make good use of the set, using the tables at times as boundaries and at other times as platforms, adding dimension to the action in a way that seems entirely in line with how teenagers would actually move in that space. The programme alerts us to the author Simon Stephens’ directive to have North American actors use their own accents, a choice that director Gregory Prest takes up. I’m in favour of this decision, since it’s always so distracting to hear British accents done badly. What’s weird though is the ways that the British lexicon ends up ringing a bit strangely in the actor’s Canadian accents, and I wonder why Stephens didn’t add provisions to change the geographical references and slang in addition to the accents. This is especially true given how sensitive the meaning is to context. The company could not have known when they programmed this show into their season how devastatingly timely it would be. Prest notes in the programme: “In recent weeks, the play has taken on a new meaning. This meaning is defined by the defiant, brave, and loud movement fuelled by our young people demanding safety and change.” Part of that movement, of course, is about gun laws in the States, and the way that conversation plays out in that particular political landscape, which is distinct from the ways it would happen in a British context. On a related note, the consternation I felt while leaving the theatre was not with the production, which was balanced and strong, but with the script itself. Gun violence is not just upsetting for the harm and the loss, but also because the causes seem to mystify us. Often discussions centre around questions of mental illness and access to guns, which further stigmatize mental illness and obfuscate better critical analysis. Punk Rock diverges from this at first, depicting teenage social development, and specifically toxic masculinity, namely the idea that real men are dominant – over other men, over social situations, over women – and don’t express emotions except for anger. Stephens’ script explicitly explores the ways that these young teenage men are grappling with their own burgeoning masculinity – Bennett’s overcompensation that manifests as abuse, Nicholas’ chill confidence that is betrayed by his attempts to hide his romantic entanglements from the other boys, contrasted with Chadwick’s very lack of investment in the traditional ideas of masculinity. And yet throughout the play, there are references to William’s detachment from reality – the way he deceives Lilly, and the way he sometimes hears things, made explicit at the end, when he explains how the sorts of thoughts people have often sound to him like voices, implying an underlying mental illness, as though the very ideas of pressure, identity, and masculinity that Stephens spends his entire play exploring are somehow not enough on their own to explain William’s behaviour. This is baffling to me since it seems like the strength of the script is exactly the opposite, portraying a nuanced spectrum of masculine adolescence, in which more than one character seems very capable of that kind of explosive violence. Despite the script’s failings, Prest’s direction is graceful and clear, opening up what nuance is present in the text and allowing the actors to play out the drama in all of its awkwardness and agony. This production will hopefully make space for even more of the kinds of conversations we desperately need to have about oppression and violence and responsibility.